The little creature with many eyes and legs lurking in the nooks and crannies of your house and garden has a fascinating story behind it. 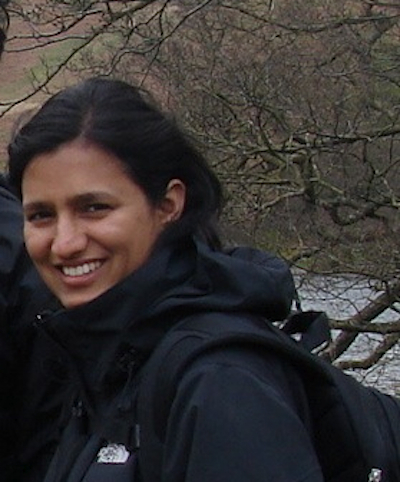 Vena Kapoor, Programme Co-ordinator, Education and Public Engagement at the Nature Conservation Foundation has been working in the areas of conservation research and practice since 1998. 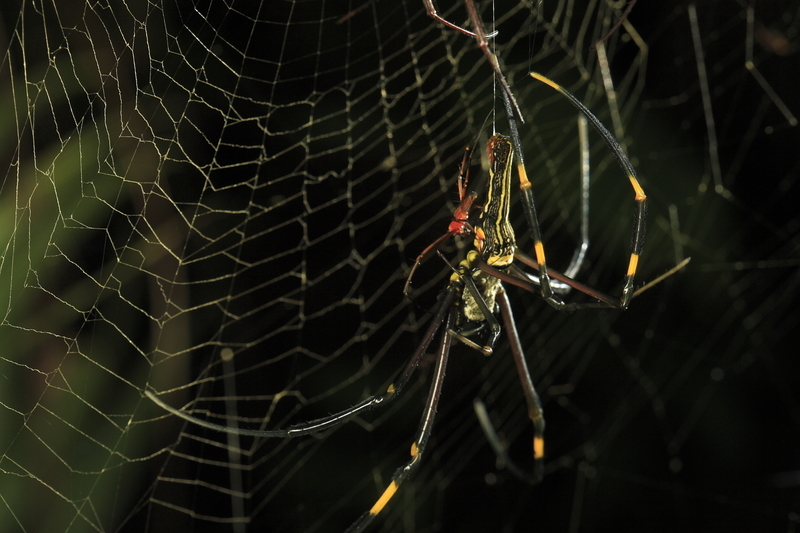 Her early research was on rainforest restoration in the Western Ghats using spiders as an indicator species and developing conservation education and outreach material. 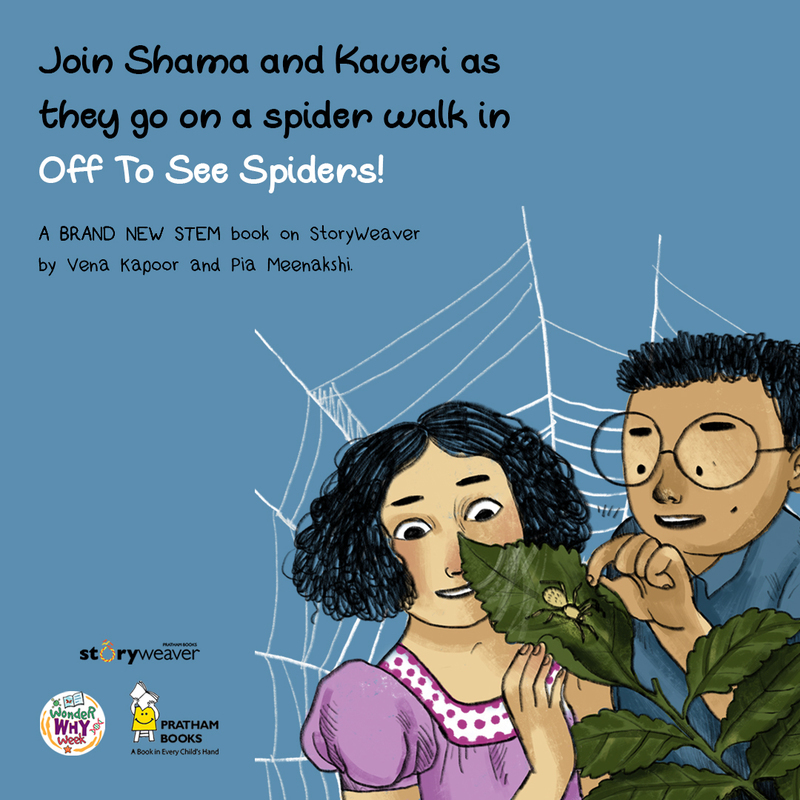 Vena has written 'Off to See Spiders' for Pratham Books, a digital first STEM book illustrated by Pia Meenakshi. This story first appeared in The Hindu in School dated September 16, 2015. What comes to your mind when someone says the word “spider” to you? Long hairy legs and sticky webs? A scary little creature lurking in some deep dark corner? If you, like many people, don't like spiders, that's quite understandable since spiders rarely get much positive press. But I can guarantee that if you make a little effort to get to know spiders better, you will gradually get fascinated – and may even end up a bit obses- sive about them, like I am! First, find a spider in your home or outside. Now, does it sit in a web that resembles a wheel, or does the web look like a complicated mess? Web building spiders can take anywhere between 20 minutes to a full day to spin their miniature architectural marvels. In many species it is only the female who weaves a web, and the males (much smaller in size) hang out at the edges, hoping to scrounge a meal. Femal Giant Wood Spider. Photograph by Sara. Webs come in different shapes: a wheel, a dome, a thick white sheet, which becomes really prominent when there is heavy dew in the morning. Most spider webs are coated with a glue-like sub- stance to capture and hold steadfast any unfortunate insects that fly into them. Radiating lines of silk alert the waiting spider when something has been caught, else the poor-sighted spider might never know! A male web building spider strums and plucks the silk at the edge of the web to announce his arrival. If he is off-tune in his strumming the male is either ignored or eaten by the female! Wolf Spider. Photograph by Sara. Perhaps you have come across a spider scurrying quickly about or jumping around athletically, with no web in sight? 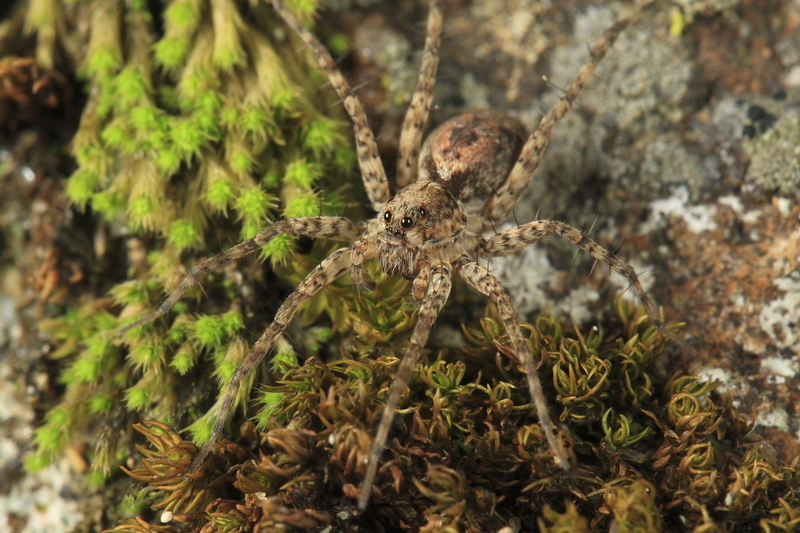 These spiders are known as hunting spiders and they rely on camouflage, stealth and deceit to get their food. Look for these spunky spiders in your house, on plants or on leaf litter on the ground. Sometimes looking closely at a flower will reveal a small brightly coloured spider that resembles a crab! 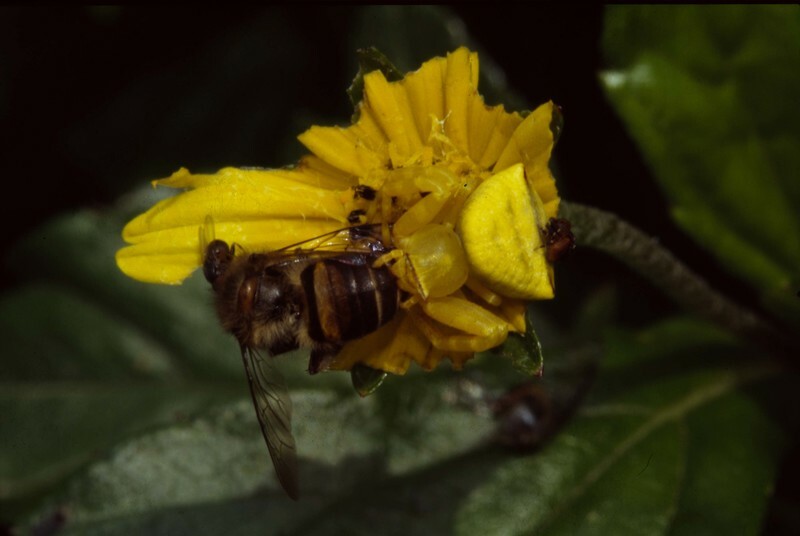 These crab spiders often match the colour of the flower they live on; and an unsuspecting bee visiting the flower for nectar is soon made a meal of. Crab Spider. Photograph by Robin Rozario. Hunting spiders with their keener eyesight are also often brilliantly coloured, which helps to impress a female, since they have no webs to strum on. They often also perform elaborate courtship dances, which consist of swaying movements of their body and legs. The world of spiders is weird and wonderful indeed. So the next time someone asks you if you would like to go bird watching, decline politely and tell them that you would rather go spider watching! If you'd like to go on a spider walk right now, read Vena and Pia's book 'Off to See Spiders!' on StoryWeaver.